There is some time left when you can save money at U.S. Converse online. Check out details below. 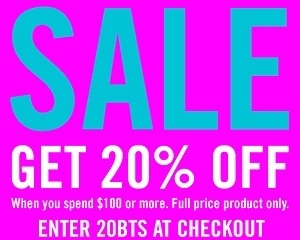 Get 20% off your purchase when you spend $100 or more. To receive the offer enter the promotion code 20BTS at checkout. Source of the information is U.S. Converse. Offer is valid until August 1, 2017. For more details visit U.S. Converse online.